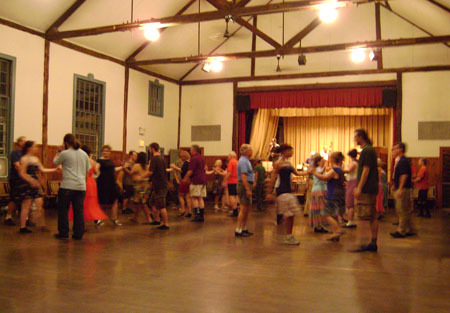 Every Monday and Thursday evening, you can find crowds of contra dancers twirling and stomping to the beat of live music at the Concord Scout House on Walden Street. 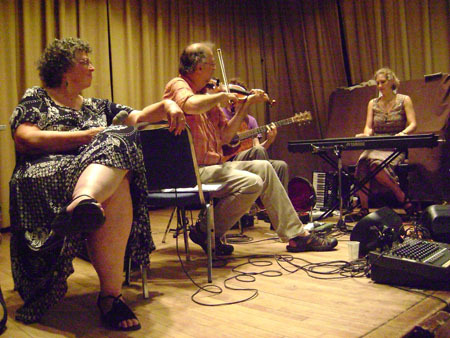 New England contra dance music finds it roots in English, Celtic, and French Canadian traditions brought to America by early settlers. After a lull in popularity, there was a revival of interest in the 1970s, which continues today. But when does a revival end and become its own tradition? With new choreography and compositions, contra dance has evolved into a tradition in its own right. So-called “old chestnuts” are performed and danced side by side with modern creations. Recently in July, veteran caller Linda Leslie called contemporary dances such as “Happy as a Cold Pig in Warm Mud,” “A Good Feeling,” and “Snow in July.” She also chose a more traditional “double contra” dance in which two couples travel through the dance together as a set. The Monday crowd tends to be a bit older, but when the hot-shot band of Perpetual e-Motion, (made up of Ed Howe on 5-string electronic violin, and John Cote on synthesized electric guitar, didgeridoo and foot percussion) played, the room had the feel of a disco. Strings of lights draped the darkened room, young couples were flapping their elbows and jiving the wave among eighty-something regulars. The tempo moved at a frenetic rate. At the end of swings, young men dipped their partners. 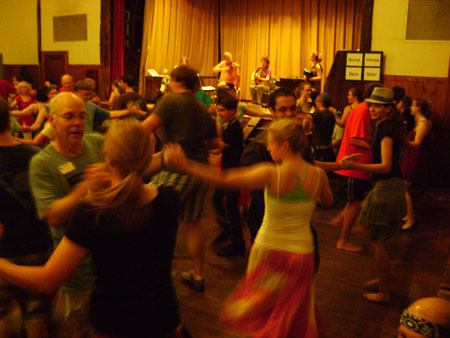 With roots going back to early America, over the last 50 years, contra dancing has evolved into a fresh, contemporary style. John Whelan and Donna Hébert: The Irish-French Connection will perform Wednesday, June 23 at Immaculate Conception School Hall, as part of Lowell’s Franco-American week. The free concert is sponsored by Lowell National Historical Park and Massachusetts Cultural Council as a way of honoring Lowell’s Franco-American and Irish American cultural heritage. 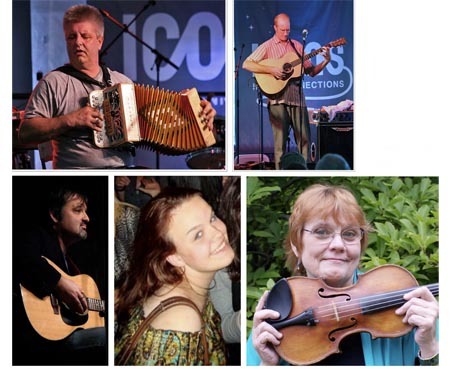 Come experience award-winning French-Canadian fiddling, legendary Irish button accordion, brilliant flatpick and fingerstyle guitarists, and powerful songs in Gaelic, English & French. Icons in their Irish- and Franco-American musical communities, John and Donna spark the Irish-French connection to life onstage! Each brings 40 years of performing and recording experience to this new group. In their stage and educational programs, repertoires and traditions stand distinct and separate and then find themselves blending and reinventing into something new, as did the Irish and French-Canadian immigrant communities in the northeast where both groups migrated in the 1880s to work in the textile mills. This free concert will take place following the ham and bean supper in the school hall of Immaculate Conception School, 218 E. Merrimac Street, Lowell, MA. Concert at 7:30 p.m. All welcome. Free parking behind school. 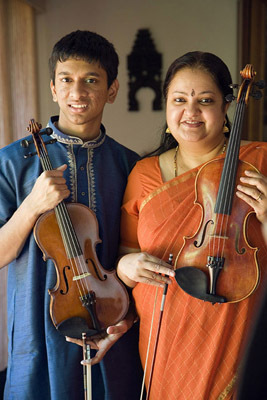 It is a question we hear all the time — what is the difference between a violin and a fiddle? It depends on what style of music someone plays, but basically, they are the same instrument. Chunk Dingle, a country guitar player from Georgia put it this way: “A violin has strings on it; a fiddle has straangs on it.” Classical musicians tend to call their instruments violins, but they sometimes refer to them as fiddles. Players of bluegrass, old-time, and contra dance tunes are more likely to call their instruments fiddles. 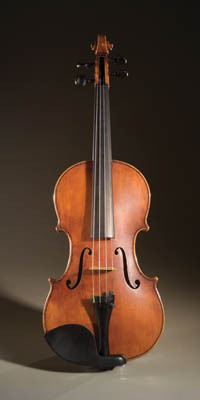 The violin pictured here was made by Bob Childs and it is currently on display at the National Heritage Museum, as part of the exhibition “Keepers of Tradition: Art and Folk Heritage in Massachusetts.” This Saturday, from 1:00-3:00 pm, Bob is going to demonstrate various aspects of violin making. You can ask questions, watch Bob measure, sand, chisel, and carve, and then go take a look at the finished product.